Myanmar MiG-29 Upgrade Revealed: Will Malaysia Follow? Ten MiG-29 fighters belonging to the Myanmar air force have been upgraded at RAC MiG facilities near Moscow, a source in the Russian delegation at the Langkawi International Maritime and Aerospace (LIMA) 2017 show in Malaysia last week told AIN. Moscow is now offering similar upgrades to Malaysia, which acquired 18 in 1994, and to Bangladesh, which procured 10 MiG-29s at the turn of the century. The upgrade solution for Myanmar is referred to as MiG-29SM (mod.). It is believed to be a low-cost version compared to the more expensive MiG-29UPG that India has been doing, and which is broadly similar to the Russian air force MiG-29SMT. Details about the MiG-29SM (mod.) are yet to emerge, but it apparently keeps the original N-019E radar, albeit with some technology insertions and part replacements. Among other things, a cross-fleet upgrade would bring the Myanmar aircraft to a single standard. In 2001 that country signed for 10 MiG-29 single-seat fighters and two MiG-29UB operational trainers. In December 2009, Myanmar awarded RAC MiG a follow-on order for 10 more MiG-29s (“Fulcrum-B”) plus six more advanced MiG-29SEs and four operational trainers. Shipments under the second order took place in late 2011-early 2012, with the last pair of two-seaters arriving in March 2013. This brought the Myanmar Fulcrum fleet to 32 aircraft. RAC MiG’s offer was to upgrade the whole fleet of single-seaters to a common standard. The Royal Malaysian Air Force (RMAF) ordered 16 MiG-29N and two MiG-29UB-N aircraft in 1994 and received them in 1995-1996. The “N” version was a customized RMAF variant, with mid-air refueling capability (taking fuel from specially converted C-130 Hercules transports), and the ability to fire two RVV-AE radar-guided missiles (export version of the Vympel R-77) at two aerial targets simultaneously. After the loss of two MiGs in incidents in 1998 and 2004, the RMAF possesses 14 airframes, of which 10 are believed to remain operational with No. 17 Squadron at Kuantan AFB. 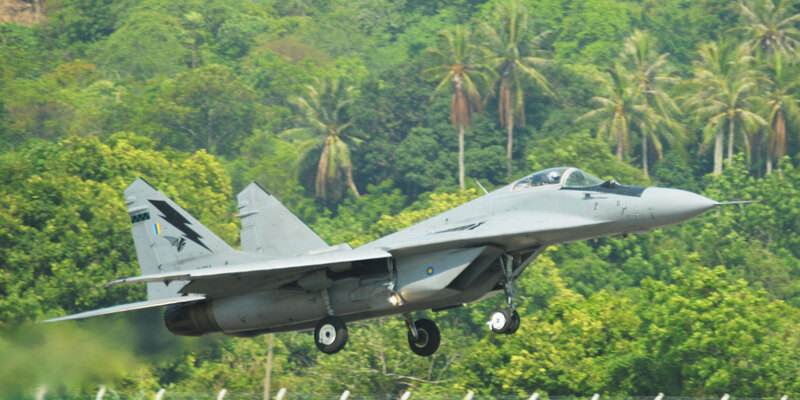 Since 2010, the RMAF has said several times that it would withdraw the MiG-29s from service, but they continue flying. At LIMA2015, RAC MiG and its local partner ATSC proposed to the Malaysian Ministry of Defence an upgrade to the MiG-29NM standard. This would have been similar to the Indian air force MiG-29UPG, involving the replacement of the N-019E radar with more advanced Zhuk-ME (model FGM-229). The upgrade would also have enabled the MiGs to carry the same guided and unguided munitions as the RMAF’s Su-30MKMs. But members of the Russian delegation at LIMA told AIN that Malaysia refused this rather costly modernization, forcing RAC MiG to come up with a less expensive option modeled on the Myanmar upgrade. Earlier this year, RAC MiG brought in a MiG-29SM (mod.) full-flight simulator to a base in Malaysia for technology demonstration purposes. RAC MiG continues working with local companies involved in MiG-29N maintenance and support. As such, ATSC has gained access to the RMAF airframes and produced a fleet report. It describes the surviving hardware as remaining in good condition, making lifetime extensions and upgrade options viable. Few airframes have exceeded 2,000 flight hours, and their maker has offered a lifetime extension to 6,000 hours and 40 calendar years.